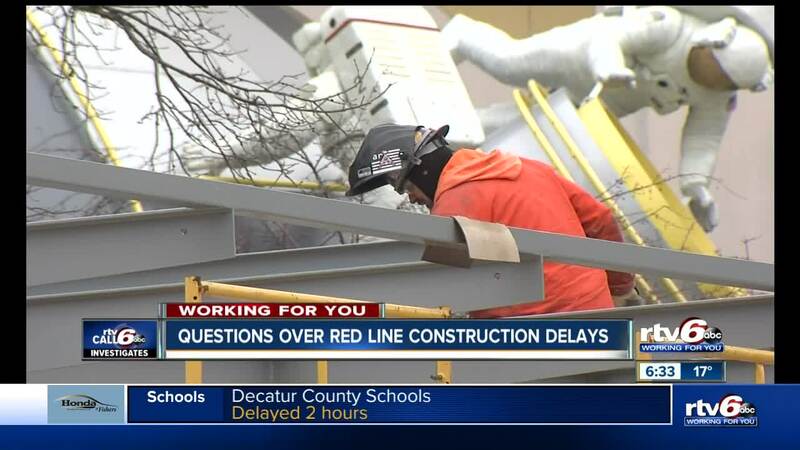 IndyGo is considering cutting some features of the Red Line project after it was revealed that the project is months behind schedule and is spending millions to get it back on track, Call 6 Investigates has learned. INDIANAPOLIS — IndyGo is considering cutting some features of the Red Line project after it was revealed that the project is months behind schedule and is spending millions to get it back on track, Call 6 Investigates has learned. On Tuesday, Call 6 uncovered that the project was 114 days behind schedule and was going to cost nearly $3.5-million to get it back on track to be completed by Summer 2019. The millions of dollars will go to fund an acceleration plan and will go to construction companies to speed up construction on the 13.1 mile bus rapid transit line between Broad Ripple through Downtown Indianapolis and ending at the University of Indianapolis. The money is coming from the project's contingency fund, a small pot of money that was set aside for issues or extra spending that was needed during the construction. But now with the fund dropping, Call 6 has learned that IndyGo executives are considering dropping some things from the project to restore the fund. "We're talking about eliminating certain things from the project to get the contingency back up," IndyGo Board Member Richard Wilson said Tuesday's Board of Director's meeting where it was publicly revealed that the project was nearly four months behind schedule. During the meeting, board members broadly discuss a list of three things that were on the table to be eliminated from the project. The only item that was specifically talked in the list was the ice melt system that was supposed to be installed on every platform to keep them free of ice and snow in the winter. Call 6 Investigates' Paris Lewbel confronted IndyGo CEO Mike Terry about the items potentially being eliminated. "We're evaluating different options and trying to see if it feasible from one cost," Terry said. "But also you still have to look at operations and maintenance of whatever these features might be." IndyGo tells RTV6 that they will present a new action item to the Board of Directors at their next meeting on Feburary 28th and will discuss modifications, including the snow melt system.